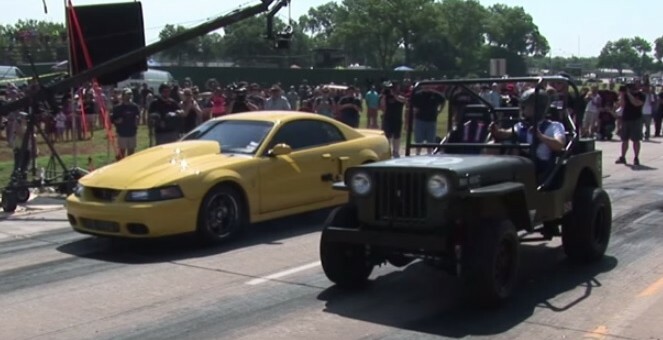 One would probably think that an old Willys Jeep going up against a Ford Mustang GT would be completely silly. But throw an LSX and some boost into the mix, and it’s a completely different story. It seems that the last time the LSX Willys made an appearance, it did not have the wheelie bars, roll cage, or even seat belts. After seeing how little traction the Jeep had with its bottle-fed LSX, it’s hard to believe that the owner would have ever run it without those safety features. Let alone survived in time to do so. Don’t get us wrong, an LSX with nitrous is an absolute force, but a boosted 4.6L shouldn’t be overlooked. However, we’d say that this isn’t the fairest match between the two, as the Willys’ less-than-perfect start and traction issues give the ‘Stang a bit of an advantage. Though we wager that power in the body of a Corvette or Camaro would have made the race a bit more even. On paper, with the power that Jeep is supposed to have, that mustang was the underdog. BUT it’s clear – traction, reaction time, and the supreme awesomeness of TURBO power came through for the win!